designed by artist Karen Talbot. ROCKLAND, MAINE, February 25, 2016 – Yesterday award-winning scientific illustrator Karen Talbot launched a new product designed with anglers in mind. The Rainbow Trout Angler’s Pint is the third Angler’s Pint featuring a full-color scientific illustration of a trout. At 21.5 ounces, an Angler’s Pint is larger than both an American and a British pint and whimsically its superiority with a fly rod fill line over a British crown and an American Flag. Talbot, who has sold over 1000 Angler’s Pints in less than a year, lives in Rockland, Maine, where she owns and operates the Karen Talbot Art Gallery. Using Kickstarter, Talbot crowd-sourced over $20,000 in funds to launch the Angler’s Pint line of functional artwork. “The concept is simple and fun, and the enthusiasm for these glasses has been amazing,” says Talbot. “I’ve shipped them all over the country and to several foreign countries. 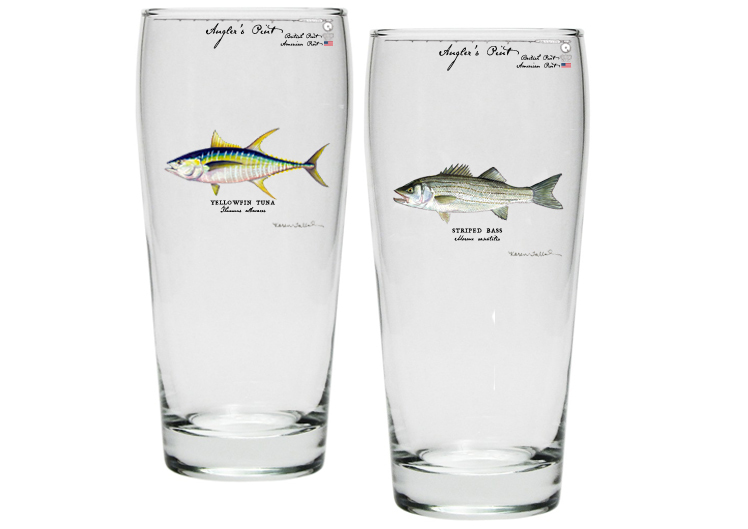 It’s been nearly impossible to keep them in stock.” Talbot, best known for her scientific illustrations of fishes, designed the first Angler’s Pint last spring. “Not everyone has wall space for a piece of artwork,” Talbot says, “but every angler I know has space for a glass with a trout on it.” Talbot refers to the Angler’s Pints as “functional art” and sees them as an important part of her business moving forward. The Rainbow Trout is the first of three new Angler’s Pint designs Talbot plans to launch in 2016. The new design can be pre-ordered by backing the Kickstarter campaign for as little as $7 per glass. Once the campaign ends on March 25th, the retail price will be $12 per glass. The Rainbow Trout Angler’s Pint Kickstarter campaign raised over 50% of its goal in the first 24 hours and is on track to exceed its goal of $5500. The new glasses are scheduled to deliver in May. If the current campaign doubles its original goal, Talbot says she will consider adding a Yellowfin Tuna Angler’s Pint to every backer’s reward at no additional charge. She was able to do something similar last spring when the Brook Trout Angler’s Pint Kickstarter campaign raised nearly three times its original goal and Karen sent all backers a free Striped Bass Angler’s Pint. A fulltime scientific illustrator and fine artist, Talbot’s work can be found in scientific journals, textbooks and popular magazines. Her work hangs in natural history museums and clients’ homes worldwide. An ardent conservationist, the tagline of Talbot’s business is “Conservation through Appreciation,” and she donates a percentage of sales to conservation initiatives. The Gallery is located at 239 Cedar Street in Rockland and is open during the winter by appointment and chance. 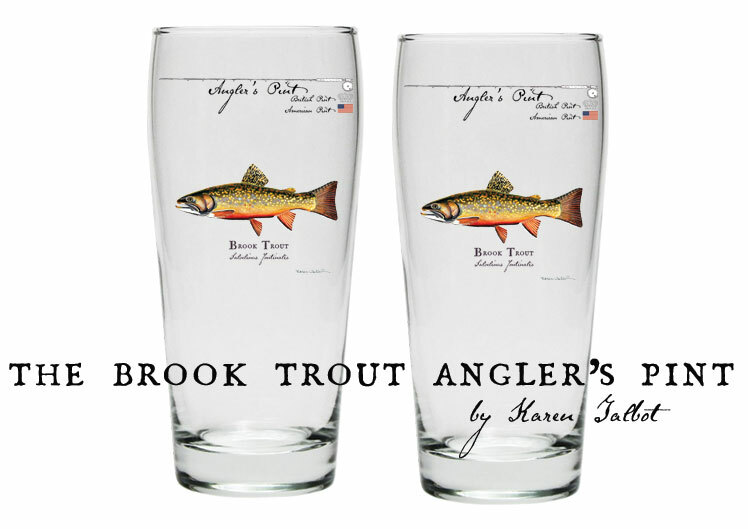 Rockland, Maine, October 21, 2015 – FOR IMMEDIATE RELEASE – Today Karen Talbot launched a Kickstarter campaign for the Brown Trout Angler's Pint, a 21.5 ounce pint glass featuring Talbot's scientific illustration of Salmo trutta. If Talbot raises her goal of $5500 by November 2nd, backers of the Kickstarter campaign will receive the first Brown Trout Angler's Pints produced. The Brown Trout Angler's Pint Kickstarter campaign follows on the heals of Talbot's Brook Trout Angler's Pint Kickstarter Campaign that raised nearly $12,000 in one month earlier this year. Like the Brook Trout Angler's Pint backers, backers of the new campaign will have the opportunity to pre-order their Angler's Pints for as little as $7 per glass. Once the campaign ends, the retail price will be $12 per glass. "The response to the Angler's Pint concept has been incredible," says Talbot. "I'm hoping that backers of the Brook Trout Angler's Pint campaign will want to also own a Brown Trout Angler's Pint." Talbot says she is also hoping to reach new customers who will take advantage of the opportunity to back the Brown Trout Angler's Pint at a level that allows them to receive both trout Angler's Pints. "Without Kickstarter, I don't think I'd have the capital to launch a line of quality, affordable glassware," Talbot says. "Thanks to the campaign's backers, my dream of bringing the Angler's Pint to life is becoming a reality." Talbot plans to deliver the Brown Trout Angler's Pints in time for Christmas. In fact, she is even offering a reward level that allows a single backer to have Karen ship two wrapped Angler's Pints to four different addresses with a personalized note in each. "It's the perfect gift for the Angler who has everything," Talbot says. To learn more about the Brown Trout Angler's Pint, watch the video below or visit the Brown Trout Angler's Pint Kickstarter webpage. Karen Talbot owns Karen Talbot Art and the Karen Talbot Art Gallery in Rockland, Maine. A fulltime scientific illustrator and fine artist, Karen’s award-winning work can be found in scientific journals, textbooks and popular magazines. Best known for her fishes, Karen’s fine art hangs in natural history museums and clients’ homes worldwide. An ardent conservationist, the tagline of Karen’s business is “Conservation through Appreciation,” and a percentage of sales is donated to conservation initiatives. The Gallery is located at 239 Cedar Street in Rockland and is open to the public seasonally Thursday through Sunday from 10:00 am to 5 pm. Karen Talbot owns Karen Talbot Art and the Karen Talbot Art Gallery in Rockland, Maine. A fulltime scientific illustrator and fine artist, Karen’s award-winning work can be found in scientific journals, textbooks and popular magazines. Best known for her fishes, Karen’s fine art hangs in natural history museums and clients’ homes worldwide. An ardent conservationist, the tagline of Karen’s business is “Conservation through Appreciation,” and a percentage of sales is donated to conservation initiatives. The Gallery is located at 239 Cedar Street in Rockland and is open to the public Thursday through Sunday from 10:00 am to 5 pm. Rockland, Maine, June 25, 2015 – FOR IMMEDIATE RELEASE – Today Rockland-based, award-winning artist Karen Talbot announced she doubled her original fundraising goal for a new glassware line featuring her scientific illustrations of fishes. Using the popular crowd-funding platform Kickstarter, Talbot set out in late May to raise $4000 in capital to fund the first production run of the Angler’s Pint. Just four days into the 30-day fundraising campaign, she reached her fundraising goal, and with less than two days to go, she has now raised more than 220% of her original goal. Backers of the Kickstarter campaign, which ends Saturday, choose rewards ranging from the first Angler’s Pints to be produced to hand-painted, limited edition glassware and even art classes and original artwork. 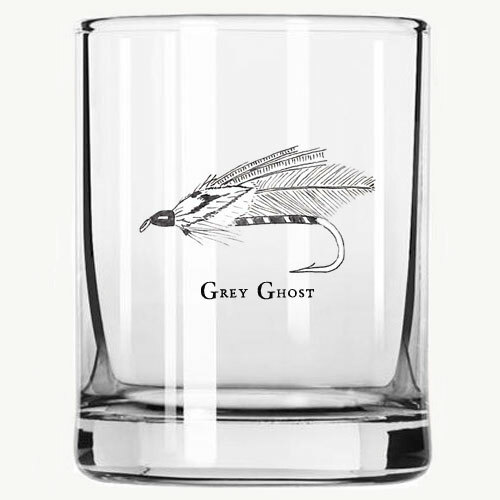 Talbot says she will reinvest the additional funds raised into immediately launching the next two products in her glassware line: a Striped Bass Angler’s Pint and a 3-ounce Grey Ghost Classic Fly Jigger. All backers have been notified that, regardless if their level of support, they will now receive both of these new glasses at no additional cost. The first Angler’s Pint is a stylish and durable 21.5-ounce glass featuring a full-color scientific illustration of Maine’s state freshwater fish—a brook trout. At the rim of the glass is a fly rod above a British crown and American flag, whimsically boasting the superiority of an Angler’s Pint (636 ml) over both a British pint (568 ml) and an American pint (473 ml). The second Angler’s Pint is identical to the first but features a striped bass. The suggested retail price for the Angler’s Pint is $10, but backers of the Kickstarter Campaign get both the Brook Trout and Striped Bass Angler’s Pint plus the Grey Ghost Classic Fly Jigger for just $8 + shipping. The Kickstarter campaign will end Saturday at 10:21 am EDT. Once the Kickstarter campaign ends, pre-orders will be available at www.AnglersPint.com, and the glassware will be available in the Karen Talbot Art Gallery, online and at both the Maine Lobster Festival and the Maine, Boats, Homes & Harbors Show in Rockland. Rockland, Maine, June 15, 2015 – FOR IMMEDIATE RELEASE – Karen Talbot Art announced an August delivery date for the first products in her new line of quality, affordable glassware designed with anglers in mind: the Angler’s Pint and Classic Fly Jigger. Both products merge everyday functionality and price with the award-winning art of artist and angler Karen Talbot. The Angler’s Pint and Classic Fly Jigger were launched with the support of a crowd-funding campaign that reached its fundraising goal in four days, proving both the concept and the price-point appeal to the target audience. 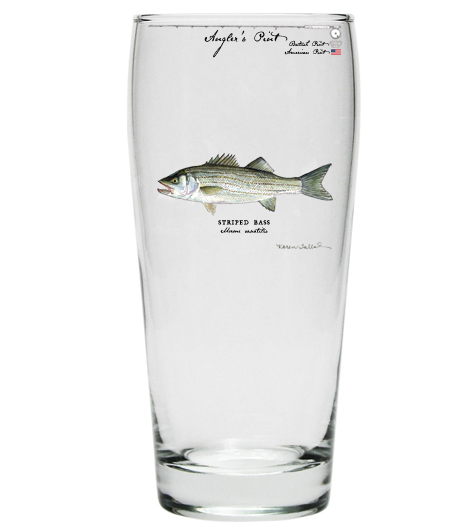 The Angler’s Pint is a stylish and durable 21.5-ounce glass featuring a full-color scientific illustration of a fish. At the rim is a fly rod above a British crown and American flag, whimsically boasting the superiority of an Angler’s Pint (636 ml) over both a British pint (568 ml) and an American pint (473 ml). The first Angler’s Pint features a brook trout. A Striped Bass Angler’s Pint is in the planning stages. Suggested retail price is $10 per Angler’s Pint. Pre-orders are available at www.AnglersPint.com. The Classic Fly Jigger is a generous 3-ounce jigger featuring a fishing fly and the fly’s name. The first Classic Fly Jigger features a Grey Ghost Fly. Suggested retail price is $6. Pre-orders are available at www.AnglersPint.com. These new glassware products are designed for everyday use and are dishwasher-safe. Wholesale pricing is available to fly fishing shops, lodges, restaurants, cafes, bars, or specialty retailers that sell distinctive home goods. Rockland, Maine, June 1, 2015 – FOR IMMEDIATE RELEASE – The Angler’s Pint, a glass featuring a scientific illustration of a trout by award-winning artist Karen Talbot, reached its Kickstarter funding goal of $4000 in less than four days. The 21.5-ounce Angler’s Pint (636 ml) whimsically boasts its superiority over both an American (473 ml) and British pint (568 ml) by depicting a fly rod over a British crown and an American flag. It also features Talbot’s full-color brook trout illustration along with both the species’ common and scientific names. Kickstarter is a popular crowd-funding platform, where start-ups and small businesses like Karen Talbot Art can raise capital from backers. Backers receive rewards in exchange for their support. For a pledge as low as $7.00 per glass, backers of the Angler’s Pint Kickstarter project will receive an Angler’s Pint. Other backers receive limited edition, handpainted glasses, art classes and even original artwork. The suggested retail price for the Angler’s Pint is $10 in the Karen Talbot Art Gallery and at select retail shops beginning in August. She also plans to offer several other glassware products featuring her artwork and which she hopes will appeal to an audience beyond anglers. Because of the popularity of the Kickstarter campaign, Talbot is currently in discussions with several local and national retail outlets that are excited about the Angler’s Pint. The Angler’s Pint is a quality, affordable full-color glassware product designed for anglers. Eight Angler’s Pint designs are planned—four trout species and four saltwater gamefishes. The full-color artwork featured on each glass uses eight screen-printed inks and is printed in the United States. The Angler’s Pint is both durable and dishwasher safe. Images are available at www.AnglersPint.com or by requesting them directly from Karen. Karen Talbot owns Karen Talbot Art and the Karen Talbot Art Gallery in Rockland, Maine. A fulltime scientific illustrator and fine artist, Karen’s award-winning work can be found in scientific journals, textbooks and popular magazines. Best known for her fishes, Karen’s fine art hangs in natural history museums and clients' homes worldwide. An ardent conservationist, the tagline of Karen’s business is “Conservation through Appreciation,” and a percentage of sales is donated to conservation initiatives. Involved in the local community, Karen has taught at the Farnsworth Art Museum, been an artist-in-residence at Camden-Rockport Middle School, and her scientific illustrations of Gulf of Maine sharks will appear in an upcoming issue of Maine Boats, Homes & Harbors Magazine. She will exhibit at both the Maine Lobster Festival and the Boats, Homes & Harbors Show this summer. Rockland, Maine, May 28, 2015 – FOR IMMEDIATE RELEASE – Today Maine artist (and angler) Karen Talbot launched the Karen Talbot Art glassware line with a Kickstarter campaign aimed at raising the capital to bring the first production run of Angler’s Pints to life. The 21.5-ounce Angler’s Pint (636 ml) whimsically boasts its superiority over both an American (473 ml) and British pint (568 ml) by depicting a fly rod over a British crown and an American flag. Below, the Angler’s Pint prominently features Talbot’s full-color brook trout scientific illustration along with both the species’ common and scientific names. “I chose to launch my line of quality, affordable glassware featuring my angling art with a Kickstarter campaign because it seemed a good way to test the concept, while raising the necessary capital,” Talbot says. “Reproducing full-color artwork on glass is expensive if you do it right, and the start-up costs were cost-prohibitive for my business at this time.” Kickstarter is a popular crowd-funding platform, where start-ups and small businesses can raise capital from backers. In exchange, backers receive rewards for their support. Kickstarter is an all-or-nothing crowd-funding platform, meaning that if the $4000 fundraising goal is not reached in 30 days, Talbot will receive nothing. “Backers of the Angler’s Pint Kickstarter campaign will get a great deal on the first Angler’s Pints produced,” says Talbot. For a pledge as low as $8.00, backers will receive an Angler’s Pint that will retail for $10 once the Kickstarter campaign ends. By pledging larger amounts, backers can also receive multiple Angler’s Pints, limited edition handpainted glasses, art classes, and even original artwork. Karen Talbot owns Karen Talbot Art and the Karen Talbot Art Gallery in Rockland, Maine. A fulltime scientific illustrator and fine artist, Karen’s award-winning work can be found in scientific journals, textbooks and popular magazines. Best known for her fishes, Karen’s fine art hangs in natural history museums and client's homes worldwide. An ardent conservationist, the tagline of Karen’s business is “Conservation through Appreciation,” and a percentage of sales is donated to conservation initiatives. Involved in the local community, Karen has taught at the Farnsworth Art Museum, been an artist-in-residence at Camden-Rockport Middle School, and her scientific illustrations of Gulf of Maine sharks will appear in an upcoming issue of Maine Boats, Homes & Harbors Magazine. She will exhibit at both the Maine Lobster Festival and the Boats, Homes & Harbors Show this summer.